Traditions, Catholic values and academic excellence are the foundation upon which Saint Mary Elementary School is built. In the spirit of the Redemptorists and the School Sisters of Notre Dame, St. Mary’s strives to foster the spiritual, moral, intellectual, aesthetic, emotional, physical and social development of our students. Spirituality is the cornerstone of our program. St. Mary’s begins each school year with an outdoor school-wide Mass at which time the religion theme for the new academic year is revealed. This theme becomes our guiding light and is intricately woven into daily prayer and instruction, as well as the weekly Rosary and monthly prayer services and celebrations of Mass. Our student body is encouraged to express their faith through service to others. Saints in Action, our school-wide community service program provides a different opportunity each month for students and faculty to reach out and help those who are less fortunate. We have partnered with local food banks, shelters and charities, a school in Philadelphia in need of new school supplies; local hospital NICU units and we have supported military efforts overseas. St. Mary’s offers a comprehensive and challenging Academic Program. We embrace Standards Based Education in our effort to align curriculum with instructional and assessment practices. Built upon the premise that reading and writing are mutually supportive processes, we have recently implemented an Integrated Language Arts program for grades K-5 and an Integrated Literature program for grades 6-8. Integrated learning facilitates the process of connecting one subject with another and prepares students to become life-long learners as well as fluent and independent readers. Our focus for the upcoming academic year will be on writing across the curriculum. Our Foreign Language Program boasts Spanish instruction for grades K-8. Our primary program begins with instruction in simple vocabulary, phrases and songs. Intermediate instruction is a paced learning experience with an emphasis on listening and speaking. Middle School instruction provides grammar application through dialogue. The study of cultural awareness is present in all levels of Spanish instruction. Technology plays a major role in enhancing and expanding our curriculum. Every classroom at St. Mary’s Elementary School is equipped with wireless Internet access, and interactive SMART Board projection, which provides seamless access to information and skill-building resources as well as opportunities for students to interact more deeply with content they encounter. Students have access to iPads to refine their proficiencies through skill-specific software and apps, to access online information, to communicate and collaborate with peers and teachers, and to create authentic products. Every teacher at St. Mary’s has been provided with a laptop and an iPad. Teachers use these devices as instructional tools and to develop and maintain a course website on which students and parents have access to robust digital resources related to course content, out-of-class communication with teachers, and digital assignments. Technology training and support is available full time through a Network Administrator, an Academic Technology Coordinator, and Media Specialists. While students in Grades K-8 attend a STEM class to supplement their core academic classes and hone their skills, technology is integrated across the curriculum in all grades. 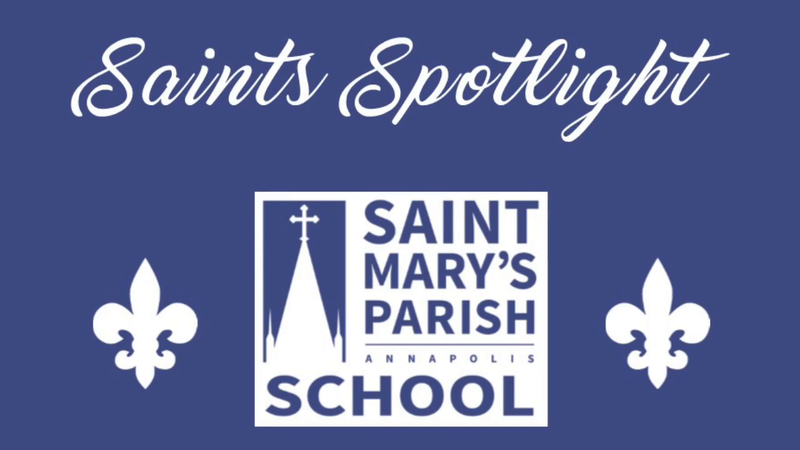 St. Mary’s also uses PowerSchool, a web-based student information system that enables parents to monitor their child’s academic performance and communicate with teachers. PowerSchool provides detailed skill-based information which enables teachers, parents, and the school to identify strengths and weaknesses and plan for individual instruction. Parents receive training in PowerSchool and are assigned a password that enables them to access their child’s academic data at any time. They can see the results of tests and assignments as soon as they are recorded and have the ability to e-mail teachers directly with questions and comments. The administration, faculty, parents, students and parish of St. Mary’s work together to keep the lines of communication open. Weekly email information blasts, newsletters from classroom teachers in grades K-4, and a vibrant learning management system in the middle school, weekly parish bulletins, our school website, individual teacher websites and the PowerSchool on line grade book are tools used to keep families informed about upcoming school and parish events, curriculum issues and grade reporting. The expansion of our after school Enrichment Program has met with great success. Through the combined efforts of paid instructors and volunteer parents we have offer a variety of interactive courses such as Chess, Hands on Science, Clay Bakers, Karate, Girls on the Run, Hero Boys, Robotics, Art and many more.